Your intake of glyphosate is happening through the food you eat, the water you drink and the places where you live and play. Some sources deliver higher amounts than others – for example, non-organic oats sprayed with glyphosate before harvest, and foods made with genetically modified soybeans. Other sources are not so clear, so we are conducting a comprehensive study to find out. 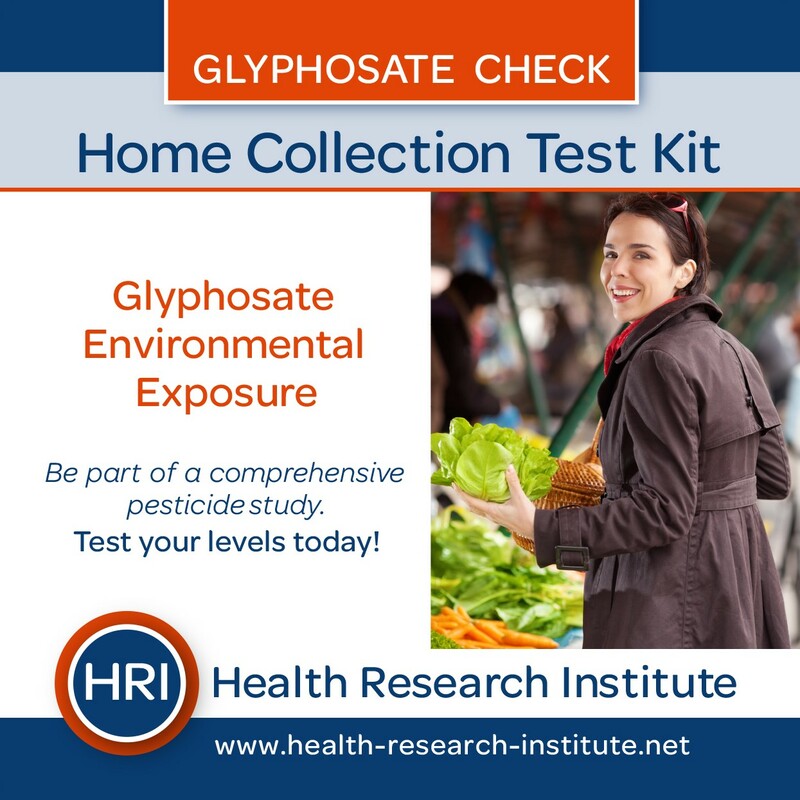 Health Research Institute’s test for glyphosate is the most sensitive and most affordable screen for glyphosate available in North America. It also screens for AMPA, a metabolite of glyphosate, at no extra cost. This is important because it is necessary to take both glyphosate and AMPA into account to more fully assess exposure to glyphosate. Test your exposure to glyphosate, the most widely used weed killing chemical on farms, lawns, schoolyards and golf courses. Join others in a crowd-sourced project to learn about ourselves, our food system, and our environment. After you order, we’ll send your sample collection kit to you by U.S. mail. Collect a urine sample just as you would at your doctor’s office, pack it in our leak-proof container, and mail it back with the provided prepaid shipper. Your sample will travel to our laboratory, where we’ll test it with a highly sensitive liquid chromatography mass spectrometer (LC-MS/MS). Your test will make a big difference when results are combined with others in our nationwide glyphosate exposure study! Add data like age, diet, and geographical location to help increase everyone’s knowledge. Check back periodically to see trends and average results.